I have been waiting some thirty years for the appearance of this CD - and especially for the suite from Williamson�s opera Our Man in Havana. This is based on Graham Greene�s �entertainment� - Greene�s quaint name for his lighter novels - of the same name. This was performed at the last night of the 1976 Promenade Concerts conducted by Sir Charles Groves at London�s Royal Albert Hall. It caused a sensation with the televised audience, for they began dancing to Williamson�s catchy Latin-American rhythms. In fact as Lewis Foreman rightly observes Our Man in Havana has surely been one of the most purely enjoyable British operas of the last forty years. 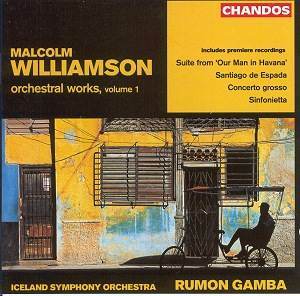 Williamson�s music for Our Man in Havana is very cinematic. In fact one could be forgiven for wishing it had been used in Carol Reed�s 1959 film of Greene�s darkly comic book. The film starred Alec Guinness and Noel Coward and was all about a bumbling vacuum cleaner salesman (Guinness) who becomes involved in espionage with tragic consequences. How that film would have been enhanced with Williamson�s music rather than that provided by the Hermanos Deniz Cuban Rhythm Band! Listen to the heroic music of the Finale, for instance; it could have been penned by Max Steiner, in fact it is remarkably like Steiner�s heroic theme from Key Largo (and Key Largo, of the Florida Keys, of course is just across the water from Cuba). This memorable suite includes a haunting waltz and some cleverly produced Hoffnung-like vacuum cleaner simulated noises in the orchestra. We must not forget that it also contains music of considerable menace as well as the captivating Latin material that persists in the head for days. So far so very good - but the problem I have is that this not over-generous first collection of Malcolm Williamson music seems over-repetitive in its styles and basic materials. Very much in the same sardonic vein and easy Latin-style of Our Man in Havana, for instance, is Williamson�s 1956 Overture: Santiago de Espada. This offers up Latin style music contrasted with an English folksong-like section first wistful then breezily syncopated. There�s a heroic/patriotic final peroration. If Our Man in Havana recollects the film music of Max Steiner, then the bleak staccato chords of the opening movement of Williamson�s Concerto Grosso (1965) recalls a trenchant Bernard Herrmann in Psycho mode. Quoting Lewis Foreman�s notes, �Consciously incorporating into it elements of the concerto style of the eighteenth century, the composer tells us that his work is �laid out to exhibit in turn the strings, brass, percussion and woodwind of a large orchestra�.� The short second movement is another darkly menacing episode with some witty interjections for brass and an array of percussion. Strings scamper merrily through the Presto vivace final movement and we are in raucous commedia dell�arte territory. Williamson�s Sinfonietta (1965) developed from ballet music he had composed, begins with a deeply morose Prelude. The mood of the second movement (Toccata. Allegro) lightens a shade and the pace quickens through the Toccata. It then picks up an even faster tempo as the music moves towards the farcical. The Ravelian Elegy. Grave is the most interesting movement. It�s notable for a cello line with odd dissonances, giving way to a mournful flute which meanders below high-pitched violins. The mood is quite Oriental before staccato brass and marimba chords disturb the calm. A Tarantella, Presto movement brings the work to a joyful conclusion. The catchy haunting music for Our Man in Havana makes this CD a must for lovers of lighter music but a not over-generously filled album with music of limited musicality might make others pause.